A Million Things to Say runs until July 1 at Museum of Contemporary Art and Design. (SPOT.ph) Fourteen years after her death, Pacita Abad still has a million things to say. 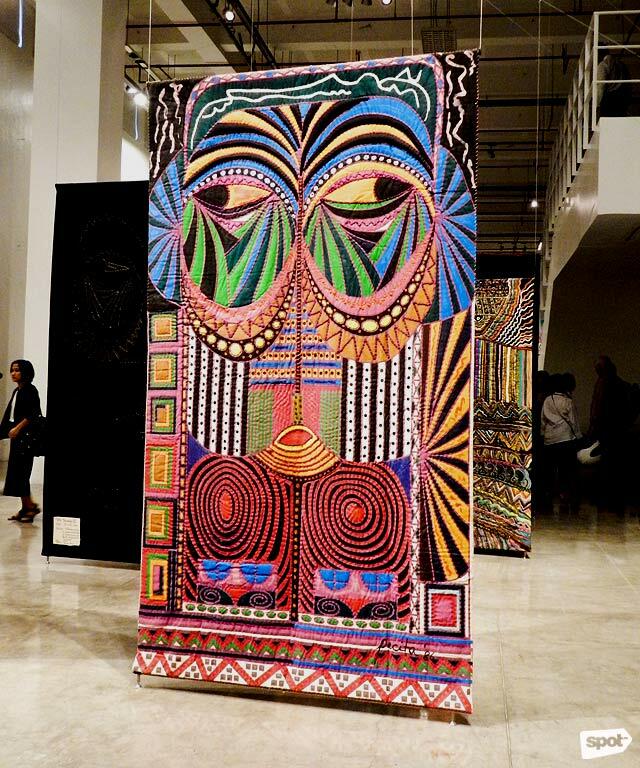 And the Museum of Contemporary Art and Design in Manila took it upon itself to showcase her life’s work through an exhibit aptly titled A Million Things to Say, which runs until July 1. 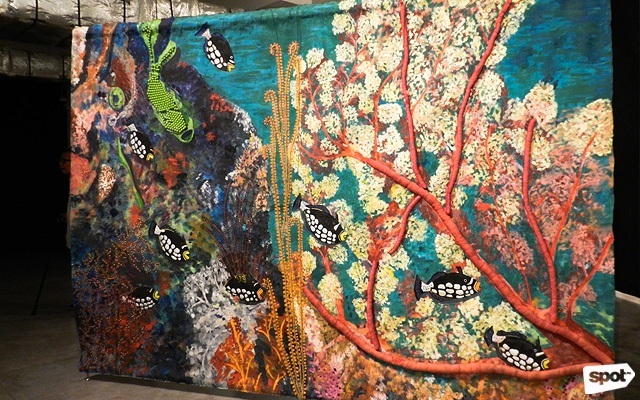 The collection features her famous “trapunto paintings” (trapunto is Italian for "to quilt), a series which shows her technique of sandwiching materials in between layers of canvases to create a three-dimensional work. This experiment rightfully earned her a reputation for her ingenuity among art enthusiasts around Southeast Asia. Along with many female artists of her time, Abad was relentless in making her mark in the art world amidst the dominance of male artists from the West. 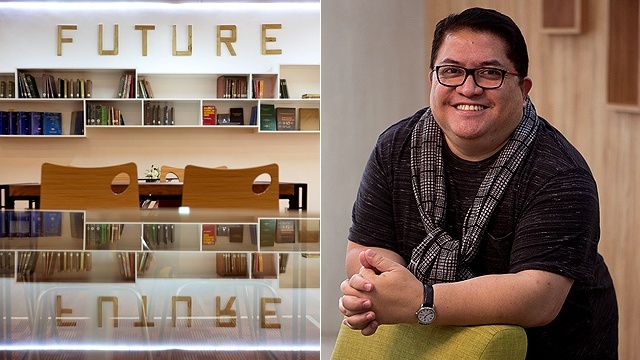 The show’s curators, Museum of Contemporary Art and Design Director Joselina Cruz and London-based artist Pio Abad, took on the huge task of going over thousands of works that Pacita had left behind in 2004. 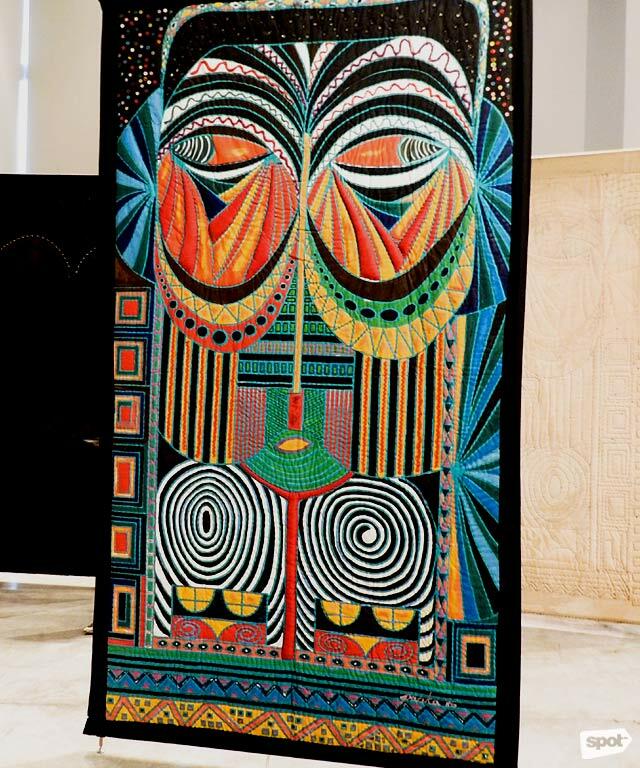 Jack Garrity, Abad’s husband and currently the Director of the Pacita Abad Art Estate, helped decide how they would present these works to her hometown audience. 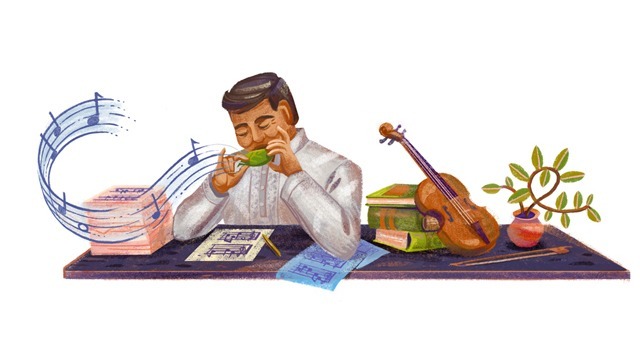 Pio, who also happens to be Pacita’s nephew, refuses to call the show a retrospective and calls it instead a “re-introduction”—a way of bringing Pacita back to the world and the world to Pacita. Abad, who was born to a political family from Batanes and was being groomed to be a congresswoman, went to the United States in the '70s to study law. She later found herself immersed in the rising art scene in the Haight-Ashbury area of San Francisco, and decided to pursue her passion for the arts instead. In 1973, Abad met Garrity and went on to travel by land and sea from Istanbul to Manila; this experience later motivated her to explore the regions of Visayas and Mindanao and find inspiration in crafts made by locals. Her husband’s work as an economist allowed the couple to travel together to developing countries such as Bangladesh, Sri Lanka, Sudan, and Yemen—which Abad found to have political issues similar to the Philippines. Although born privileged, she understood her position as an immigrant and as part of a minority, and those are things she made use of in her artwork, pushing for social justice through the arts. She was mesmerized by shadow-puppet plays in Indonesia, ink-brush painting in Korea, tie-dye technique in Africa, and other traditional art techniques in countries like Papua New Guinea, Dominican Republic, Pakistan, and India. Fragments of these practices would later show in her works that put both the familiar and foreign on canvas. 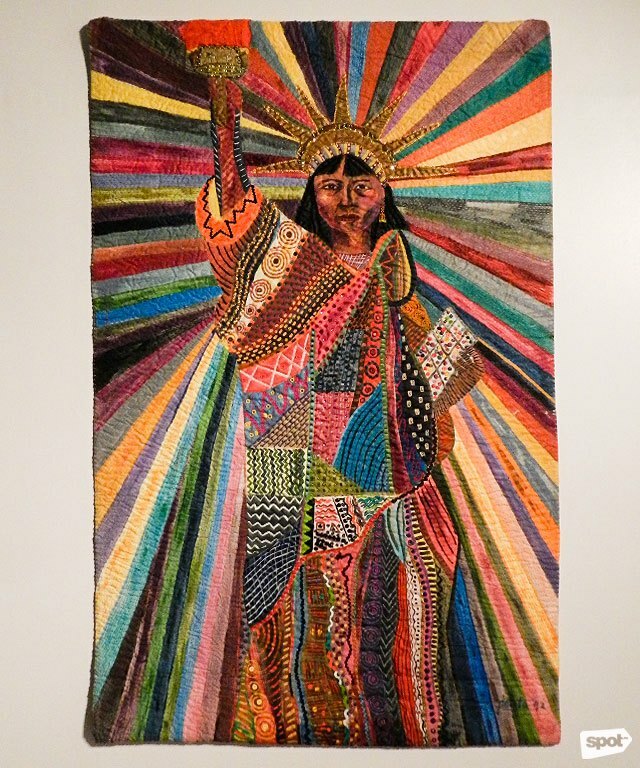 Abad’s body of works exhibits the multiplicity of textures and materials, especially in the large tapestries she assembled to form what she called “trapunto paintings.” This style comprises several techniques that involve not only painting but also quilting, embroidery, and sewing. 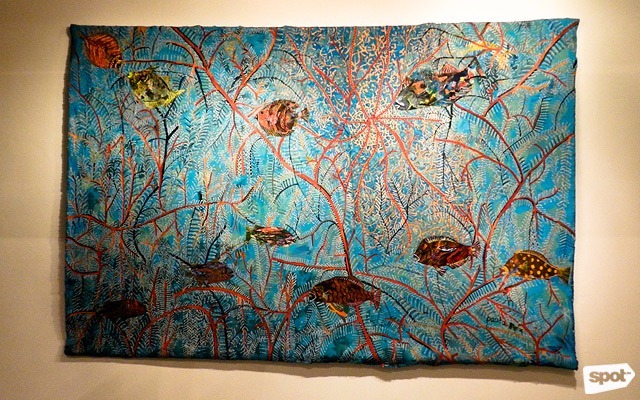 Objects like beads, shells, and buttons are sewn into the canvas to evoke the dilemma of whether to focus on colors or on objects, or on the tactility or flatness of the figures. Shortcuts were not acceptable to Abad. 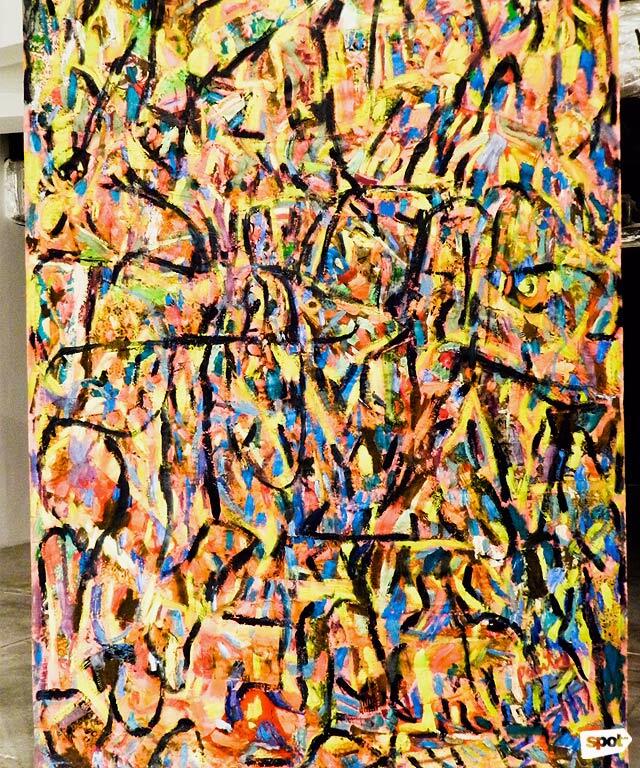 Her production process would begin by working with a silkscreen to complete the first layer, then applying a base foundation made from paint, and then moving to complete the assemblage by adding patches, sequins, and other materials. 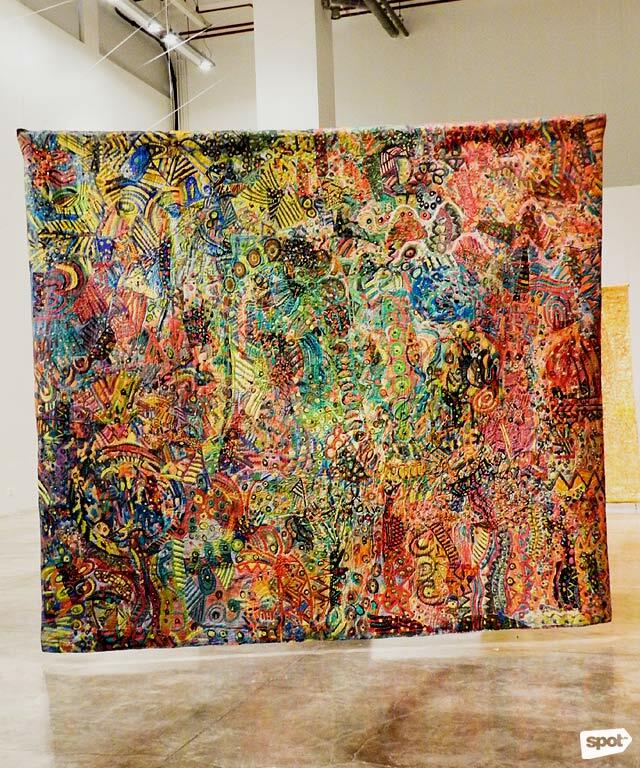 Working with tapestry can be tedious; and given the large scale that Abad preferred to work with, she would sometimes employ the help of family members while working at home. She never enjoyed working alone in a studio as she would often long to immerse herself with nature and people. Abad also led a life of ironies. Though raised in a political family, she chose to live independently away from the shadow of politics and closer to the marginalized communities of developing countries. Her experiences as an immigrant and as a female artist pushed her to defy and question power and the many labels that are forced on women. Her body of works, though appearing to be playful and aesthetically pleasing, embody serious political themes and social issues relevant to her and to the times. For example, “The Sky is Falling, The Sky is Falling” is her take on the fall from power of Muhammad Suharto in 1998. Suharto ruled as Indonesia’s president for more than three decades amid accusations of dictatorship, fascism, and corruption—which bears a striking resemblance to the Marcos regime that Abad once protested against. Abad lived in Jakarta from 1994 to 2000 and she saw how people suffered under the Suharto regime. After a 30-year career in painting, Abad created over 4,500 pieces exhibited in over 200 museums. She returned to the Philippines in September 2004 for her last show at the Cultural Center of the Philippines, and died three months later at the age of 54 in Batan Island. 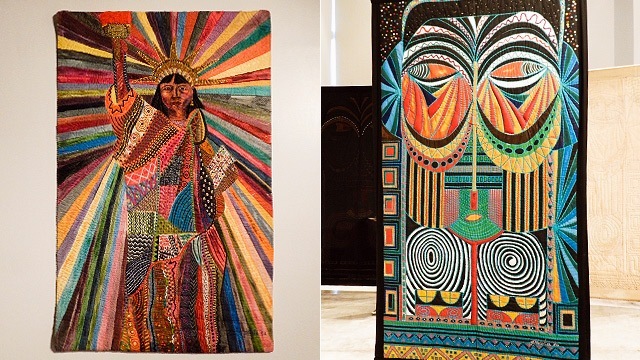 Pacita Abad’s career in the arts may have been cut short, but her legacy is carefully stitched into each of her works—tirelessly waiting for an audience, generation after generation, echoing the million things and meanings that her works continue to say. A Million Things to Say runs until July 1 at Museum of Contemporary Art and Design, College of Saint Benilde's School of Design and Arts, Dominga Street, Malate, Manila City.